If there’s a better-looking motorcycle out there than the 916-series of Ducati L-twins, then we’ve yet to see it. Jim Lindsay rides his restoration. 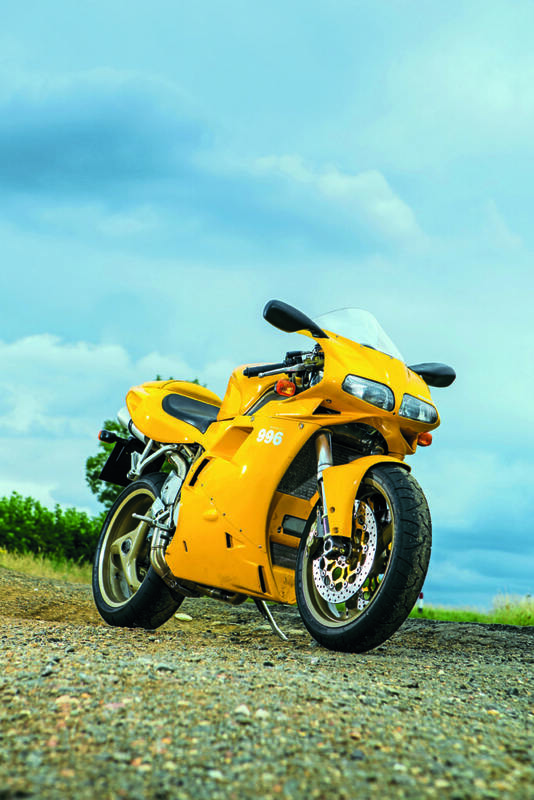 If riding any of the later desmoquattro variants, 916, 996 or 998, does not stir your soul – consult an undertaker. You are most likely dead. Aprilia tried with the RSV, Honda found World Superbike success with the SP-1 and 2, Moto Guzzi still plugs away with its quirky transverse engines, but nobody, not even Ducati itself in later years, has ever got the V-twin sportsbike as right as the Bologna factory did as the 90s drew to an end. 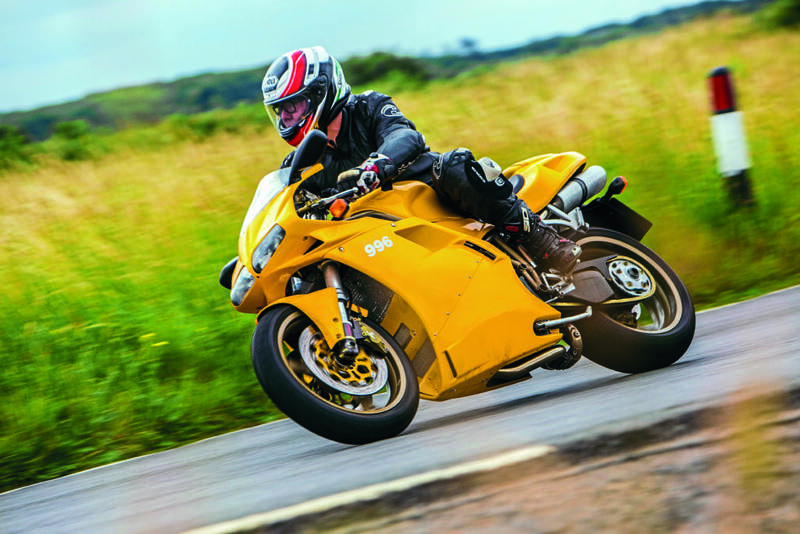 The subject of this test is a standard 1999 Ducati 996 Biposto and as a riding experience it is unbeatable. It is the most affordable of the desmoquattro twins and, in stock trim, as user-friendly as these devices get. As a rider, you are engaged from the moment you press the button and wince as the starter motor struggles to shift the 98mm pistons against the 11.5:1 compression ratio. Anything less than a fully charged battery and the result will be marginal, and don’t forget to push in the button underneath the twist grip to give the required smidgen of throttle opening. But, oh that noise when it catches! Even on the standard pipes (which I prefer) the ‘crobba-crob thump’ of the exhaust, the low frequency vibration on tick over, and the rattle of the dry clutch plates banging around in their basket is one of the great sensory delights in the world of motorcycling from any era. On the move, the 996 is nothing like as uncomfortable as some people may have you believe. 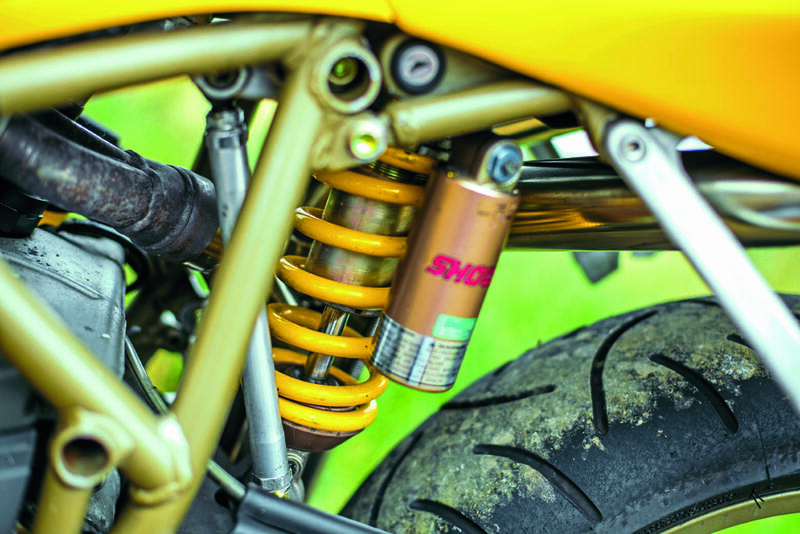 I’ve been lucky to ride a few desmoquattros over the years and the most common fault I’ve found is a tendency for the suspension set-up to be too firm, often in the mistaken belief that it aids handling. It doesn’t, it just makes it uncomfortable, especially on bumpy roads. As, for the moment, this is my bike, I made sure everything was correct. My reference point for set-up was a thoroughly sorted 916 that I spent the day with about five years ago. It was so easy to ride for long stretches. On the bike tested here, the Showa forks and rear suspension unit have been rebuilt. I set up sag, compression and rebound to suit my 94 odd kilograms of meat and bone. Get it right and the 996 will return a tolerably smooth ride on gnarly B-roads and a brilliant ride on more even Tarmac. In high-speed curves, the Ducati is exceptionally stable. It also responds well in slower bends, turning quickly and precisely. It gives away little to newer bikes when cornering. In the extremes of a track day fast group, you can still see the occasional 916, 996 or 998 giving newer machinery a hard time. Staring with the 916, Ducati did an amazing job of keeping the bike short. This is no easy feat with a 90° V-twin (or L-twin as some folks insist it be called). Whichever way you position it in the chassis, it’s a lengthy lump. Go back to the old air-cooled, bevel drive 900SS from 1977, and you’ll find a wheelbase was a whopping 1500mm (about 59 inches). It was an art getting them through tight corners. The first desmoquattro, the 851, got this figure down a bit to 1460mm. The 888 managed to shrink it to 1430mm. The 916, 996 Bip and 998 all had a wheelbase of just 1410mm. That compares well with its contemporaries, many of which had inherently shorter engines. The 2001 Suzuki GSX-R1000, for example, had exactly the same 1410mm between the axles as the Ducati. In a further neat piece of compact design, the underside of the petrol tank forms the upper portion of the air-box. The exhaust, that exquisite set of pipework, is so compact that it needs no extension of the chassis to provide mounting points. Ducati practised mass-centralisation long before it became a buzzword in Moto GP and then in bike design as a whole – even if it was part of the original FireBlade’s make-up. The suspension has all the tunability you would expect, front and rear. The Showa components give great service when properly set-up. For road use the Ohlins parts on the more expensive variants do not add a useful performance advantage. The steering geometry has built-in adjustability which is still found on few production bikes even today. Up front, the steering head bearings are clamped in an eccentric housing. On the standard road setting, you get a steering head angle of 27° with trail of 97mm. If you want quicker steering, you can slacken the pinch bolts, rotate the bearing holder in its housing and you end up with a steering head angle of 23° 30’ accompanied by trail of 91mm – a noticeable difference but again, not something you need for road use. If you do want to try it, you need to know that the steering lock does not work on the sportier setting. Also, move the steering damper its alternative mounting point. The rear ride height is also easily adjustable. For track work, you will probably want to experiment at both ends but I found that the standard geometry was near perfect for road work. The machine here is shod with Bridgestone BT-014 tyres. These are more than adequate for the Ducati’s performance. They give great feedback and work equally well wet or dry. Unless you’re heading for the fast group on a track day, you need nothing more. Super-sticky tyres look good and may even massage the occasional ego. If all your miles are on the road, however, they are costly pieces of vanity. And so to the engine, the magnificent, bellowing, four-valve per cylinder, desmodromic magic ingredient. 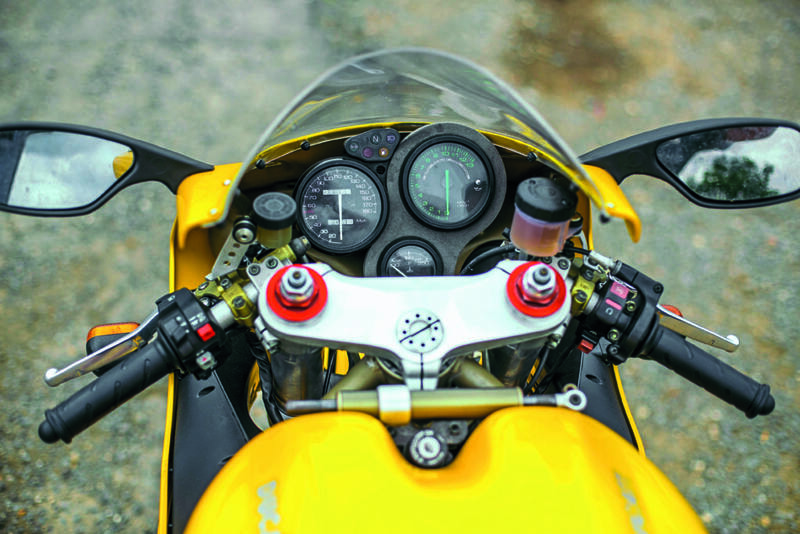 The design had its origins in the Ducati Pantah, released in 1979 and designed by Fabio Taglioni, albeit air-cooled and with just two-valves per cylinder. With some input from UK engine specialists Cosworth, Massimo Bordi developed a prototype, liquid-cooled engine with four-valves per cylinder and a capacity of 750cc. In 1986 this engine in a modified 750 F1 frame was ridden by Marco Lucchinelli, Juan Garriga and Virginio Ferrari in the Bol d’Or 24 hour race. It was lying 7th with nine hours to go when a failed con-rod bolt forced the machine into retirement. The results were promising and from this experiment came the 851 and later 888 machines, both of which claimed World Superbike championships in the hands of Raymond Roche and Doug Polen respectively. To carry on reading, you can purchase the October 2017 edition for the whole feature with plenty more expert knowledge and more pictures! Just click here!